50th Birthday flight - Oldnautibits takes to the air! 2005 - Aviation being firmly in the blood, it seemed only natural for Geoff Pringle to celebrate his first 50 years with a flight in a vintage biplane. Just like his father, who 60 years before had taken to the air in a Tiger Moth, Geoff relived the experience in a classic 1946 French built Stampe SV4c, the primary trainer of the French Air Force at that time. The flight was organised by Dawn Patrol Aerobatics who operate out of Dunkerswell Airfield, Devon in the south west of England, the only US Navy airbase on British soil during WWII. The flight instructor for the day was Rob and suffice to say Geoff opted for the company's ultimate flight - "The Waldo Pepper" - which exceeded expectations on all counts! The programme, which followed the course of an introductory flying lesson, enabled Geoff to take the major controls for a large part of the flight (instructor's comments "better than average with a light touch on the controls")! Geoff, wearing Irvin jacket (what else! ), flying helmet and RAF mark VIII goggles, found it easy to travel back in time to the summer of 1940 as they flew over Honiton, the south coast and on above the English Channel. 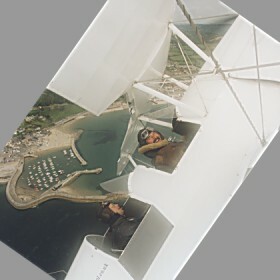 The flight continued over the village of Beer, then east to Lyme Regis where Rob introduced Geoff to some mild aerobatics - having first tightened down his sutton seat harness! The Stampe then turned north and overflew Taunton, before returning to Dunkerswell, sometimes at low level, over common moorland "beating up" the monument at Wellington. Geoff's 40th birthday "hot air balloon" flight was good but "The Waldo Pepper" experience was exceptional - making it a hard act to follow in 10 years!! 2018 - we understand that Dawn Patrol are no longer in business. The great pictures are courtesy of Skydive UK Video.